To resolve the selective corporate censorship that targets political foes of left-wing America, lawmakers and internet participants must embrace the understanding that denial of the right to participate in the dominant online platforms for debate and expression is, in essence, an attack on the fundamental human right to exist in — and participate in — our modern tech-driven society. If there were a broad marketplace of equally competing online services and gatekeepers with roughly equal market share, each representing different viewpoints or “clusters” of political thought, users would be free to choose, for example, the “pro-Trump” version of Facebook, Google, YouTube, Twitter, etc. But no such alternatives exist at anywhere close to even 25% market share. These dominant internet gatekeepers enjoy market share dominance of 80% or better, in their respective categories, meaning that both content creators and content consumers have no reasonable alternative destinations from which to choose. Furthermore, all of today’s dominant tech giants lied about their policies from the very start, pretending to exist as open platforms welcoming all forms of legal speech. 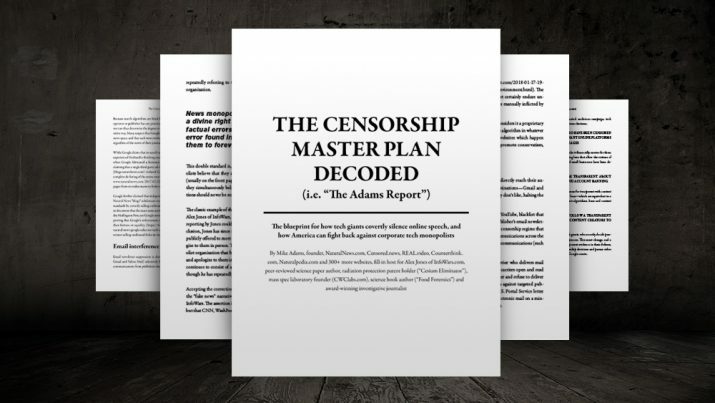 Yet after they achieved dominant market positions, aided by users promoting their channels on those platforms, they selectively began censoring and deplatforming conservative speech, casting aside the very people they once promised would be provided a platform for freedom of expression. Through this deception, the dominant internet gatekeepers have become the de facto providers of essential infrastructure through which modern citizens carry out their personal and professional lives. To deny individuals their right to exist in modern society — by shadow banning, deplatforming or artificially throttling their online expression — is to violate an individual’s pursuit of life, liberty and happiness. It is to deny their very right to exist in modern society. Dominant online platforms have become the de facto providers of essential infrastructure through which modern citizens carry out their personal and professional lives. To maliciously censor those individuals due to the color of their speech is to deny them the right to meaningfully participate in modern society. The political Left applauds the stripping away of the First Amendment rights of their political opponents, even while demanding such rights be protected for themselves. That the political Left in America today sees nothing wrong with the selective termination of the online existence of targeted political opponents is just as disturbing as the action itself, for it demonstrates the shocking lack of fairness or tolerance now routinely demonstrated by left-leaning individuals who themselves benefit from the very channels of expression they seek to deny to others. The overriding internal justification for such an egregious — even malicious — justification is the belief that the only people who should be allowed to participate in modern society are those whom obediently agree with the ever-expanding list of left-wing “truisms,” many of which deny the most basic laws of biological and scientific reality (such as the now-common belief that infants are born as genderless beings who are arbitrarily “assigned” gender at birth, a belief that grossly contradicts biological and scientific reality). In essence, Google, Facebook, YouTube, CNN, the Washington Post and others are asserting one of the most dangerous and absurd ideas in Unites States history: That if you do not wholeheartedly agree with the increasingly radical “truths” of left-wing society, you shall be denied the right to exist altogether in modern society. Such positions have been openly argued in op-eds published in the New York Times, for example, where Bryan W. Van Norden, a professor of philosophy at Wuhan University in China, argued that no person should be allowed to speak in the online world unless they are first “properly educated” in liberal ideology (https://www.newstarget.com/2018-06-27-nyt-op-ed-calls-for-the-complete-silencing-of-all-conservatives-forever.html). What is his definition of “properly educated?” For starters, he is a Chinese communist who believes in the supremacy of the state and the permanent subservience of citizens. We need not explore further, since his very nationality reflects an abusive, anti-humanitarian authoritative regime that nullifies any legitimacy of his argument. Because of the necessity of participation in the online world in order to pursue life, liberty and happiness in a tech-driven society, the censorship of an individual or organization by internet gatekeepers is a de facto act of defamation against that individual or organization. Having your voice silenced by YouTube, for example, announces to the world that you must be an unscrupulous person of some kind; perhaps someone who violates intellectual property laws or who engages in unscrupulous spam. In truth, YouTube, Facebook and other internet gatekeepers have banned and shadow banned organizations for reasons rooted entirely in the color of their speech. It isn’t just political speech that’s targeted, either; it’s also speech about natural health and disease prevention. Yet the perception among other members of the online community is that you have been punished for some egregious violation of ethics or rules, even when your only “sin” might have been to innocently post educational content the tech giants wish to suppress from public view. Thus, YouTube is deliberately banning users and entire accounts for discussing the therapeutic effects of a plant-derived molecule; the same molecule the FDA has just recognized as a therapeutic “drug” when sold with a specific brand name. (Epidiolex has no other active ingredients beyond CBD.) Such actions smack of Big Pharma protectionism and lend themselves to further investigations of potential collusion and racketeering among Google, Facebook, drug companies and the FDA. … and dozens more. It is possible that some of these accounts may have been restored, but the fact that they were banned in the first place demonstrates the important point here.